During this Sunday night and Monday morning a strong storm and heavy rains are expected. The National Hydrometeorological Institute (DHMZ) announced the orange report on Sunday, but as it seems, from Monday morning we will be colored in red! Thus, next few days will be marked with a strong and stormy southern wind, especially in the second part of the day. The strongest winds will range from 90 to 145 kilometers per hour. Expected rain perpiration is from 70 to 110 mm, with many thunderstorms. 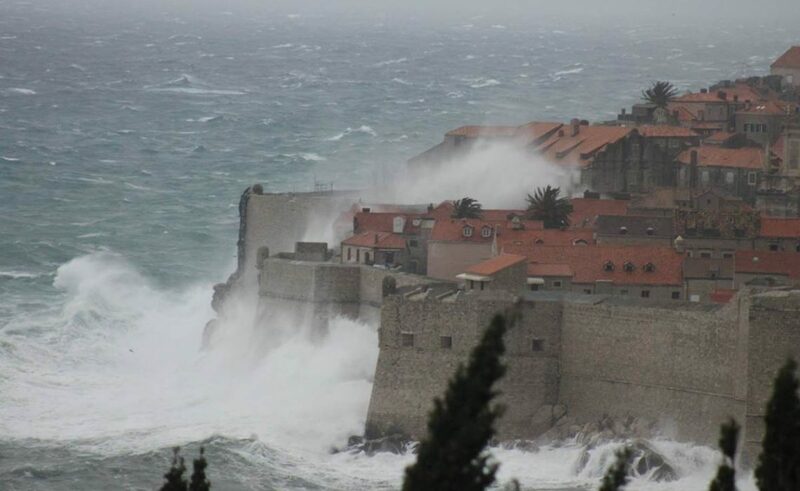 According to the information of HAK (Croatian Auto Club), due to the storm winds, Ubli (Lastovo)-Korčula-Polače (Mljet)-Sobra (Mljet)-Šipanska luka-Dubrovnik, Dubrovnik-Koločep-Lopud-Suđurađ and the Prapratno-Sobra ferry line is cancelled, as well as night line Dubrovnik-Bari. This line is scheduled for Tuesday, October 30th, starting at 10 am. There is a risk of personal safety due to broken trees, broken branches and flying debris. Widespread structural damage, traffic interruption, and power supply interruption are expected. Act according to the advice given by the competent authorities. More pronounced floods are expected that will capture a larger area and flood the property with a significant risk to life and the possibility of evacuation. There are probably more breaks in traffic, as well as interruption and loss of energy, communication and water supply. Dangerous driving conditions due to reduced visibility and slippage on wet track are expected too. Be prepared for stronger thunder storms that can cause great damage and protect yourself against storm lightning.